October 22, 2018 January 14, 2019 ~ Mike K.
We booked a few escape rooms. I simply did a search for “escape rooms in Zagreb” and we had a few options. Escape Art was selected because of the themes they had, as well as the incredible amount of detail for each room on their website (and snarkily written with some great puns, I must add). You are wildlife explorers in the forests of Transylvania. On your way home, you decide to seek shelter in a castle that you’ve found in the distance. Unfortunately, after a bit of exploring, you see a painting on the wall of the owner, who is none other than Count Dracula, and a table that seems to be set for an upcoming meal. It’s now 60 minutes until sunset, and the heavy door bangs closed behind you. Search the castle for the key to the door, and escape before you become Dracula’s breakfast. The mission is a simple one, which goes towards the original premise of escape rooms which is to ESCAPE THE ROOM (not necessarily just completing some sort of mission parameters). This can probably be more difficult by also adding in “find his hidden treasure”or “find his documents detailing his plans for when he moves to London,” but I don’t think it was necessary here. Lots of puzzle and lock types in this room, including a lock that I had never seen before. (This one has all the digits from 0-9, and you simply push the 4-digit combo and then pull a lever on the bottom of the lock to trigger the mechanism, which was pretty cool. This type of lock, however, doesn’t allow repeating digits, and it doesn’t matter what order you input the numbers to the combination). I liked a lot of the puzzles in this room…some where hands-on and required a bit of fishing, while others tested your ability to follow directions and pay attention to the things you found during that progression, and others that required you to decipher some items, and finally to test your mettle in trying to achieve your final mission parameter. The locks were primarily padlocks and some combination locks, but they fit the room well. I’d suggest a bit more tech here or there with a jump scare or two (since this is a room based on the ultimate horror story, after all). The number of puzzles in the room was well done, and ranged in complexity from solving within 30 seconds to others that took a few minutes each. 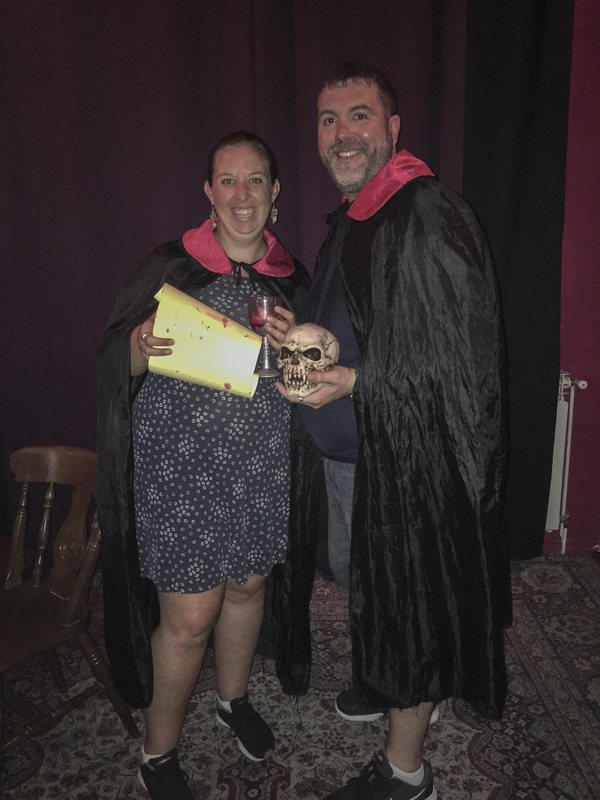 There were a lot of things that you could easily overlook (and we did), which made the experience a bit tougher with just two people, but – hey – we used our 3 hints and progressed really well through the room. The decoration in the room definitely lent itself to the immersion factor. You feel as if you are in a drafty old parlor in a castle. The props and things in the room fit the mission and theme… almost 100%. I would say that having a mirror in the room didn’t really belong, if you remember that vampires really, really hate mirrors because they don’t show their reflections. The flow of the room was pretty good… very linear, but it worked well with a small group and moved you along from solving something quickly to something else that you had to work on for a few minutes, or search around to find that one key element. There was one puzzle that I really enjoyed, which was a take on another that I’ve seen elsewhere, but I loved the spin that they put on it. I’ll just say “clock” and you’ll figure it out when you actually do the room. There was some reading involved to get through some of the puzzles, but it wasn’t excessive, and I’m very, very glad it was in English! We definitely had a good time in this room. As it was just the two of us, we really had to communicate with each other as we were solving things, and had to work together as well on some of the puzzles. Jasmina was awesome. She let us work at our own pace, and gave us the time checks that we asked for (even though we had a clock in the room). Yes, the hints to solve the few areas where we stumbled put us back on the path, and gave us nudges towards areas where we may have already been looking. I did feel stupid a few times, simply because we overlooked some very small, but important details. Final Thought: I’m a huge vampire fan, and when we saw this room, we decided that we had to do this one vs. the other rooms they had. Jasmina actually encouraged us to try out their other room, but we had another appointment (see our review of our walk-through of Robin Hood). This room may not be flashy with a lot of tech, but it was fun to play and a great way to start winding down our vacation. The descriptions of the rooms on their website are probably some of the best we’ve seen in all the rooms we’ve done. Jasmina was a great host and her excitement about her location got us excited to play as well and it was great to chat with her for a few minutes before we entered Dracula’s castle.